Crème fraîche is fresh, heavy or double cream with 30–45 percent butterfat that has been thickened and slightly soured by adding lactic acid bacterial culture. This results in a truly delicious and exceedingly smooth rich cream with a hint of lemony sourness. It has a pH of around 4.5. The word crème fraîche literally means “fresh cream”. In some European countries regulations disallows any other ingredients other cream and bacterial culture in Crème fraîche and also dictates the fat content of the cream used. How is it different from Sour Cream? Crème fraîche is less sour and less viscous than the sour cream found in North America. It also has higher butterfat content than Canadian sour cream, which usually has about 14% butterfat content or less. The fat content of fresh sour cream must be at least 18% in the US. (The Wellness Encyclopedia of Food and Nutrition). Ingredients in crème fraîche are cream and bacterial culture only. There are no other added ingredients. Ingredients in sour cream are: Milk Ingredients, Modified Corn Starch, Guar Gum, Carageenan, Locust Bean Gum, Sodium Citrate (preservative) and Bacterial Culture. Sour cream has many added ingredients and a longer shelf life due to addition of sodium citrate, which acts a preservative. 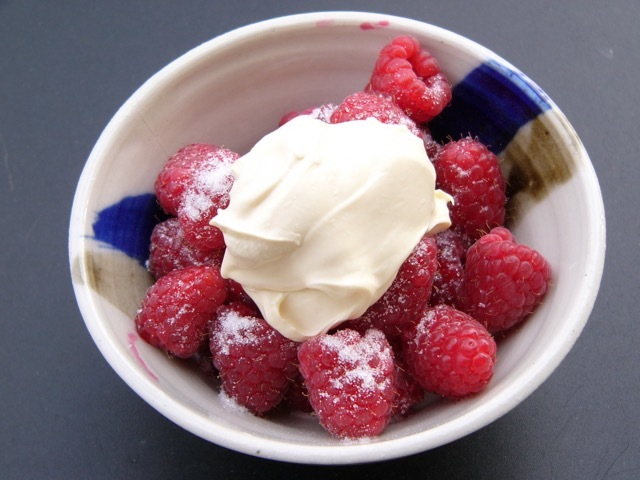 Crème fraîche has a richer flavour and creamier texture so it forms the basis of many desserts and dessert sauces. It can also be used in hot savoury and sweet sauces and due to it’s high fat content, it does not curdle when heated to high temperatures. Prev What is Evaporated Milk?